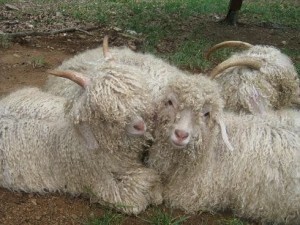 Eastern Angora Goat and Mohair Association (EAGMA) is a newer name for our association. Until recently we had always been known as Virginia Angora Goat and Mohair Association (VAGMA). The primary reason for the original name and the subsequent name change has been regional participation. VAGMA was formed in 1987 by a small group of Virginia breeders in Nelson County and remained a largely central and western Virginia organization for the first ten years or so. We have now grown geographically and we thought the new name more reflective of our current membership. Membership has grown as a result of the original members attending local fairs and festivals with Angora goats and promoting them effectively. The mohair was mainly sold to hand-spinners very locally in the beginning. Eventually members began to pool their hair and send it to Texas. It started somewhat serendipitously when a member with a truck planned to make the trip to purchase some fine Texas goats. In 1992, VAGMA held its first annual Angora Goat Show at the Rockbridge County Fair in Lexington. The show was held there for four consecutive years, then moved to the Rockingham County Fairgrounds in Harrisonburg for several years and then to the Nelson County Fair at Oak Ridge. Sometimes the move was to increase VAGMA’s profile, but on one occasion it was for the simple fact that the vendors were consistently hot and uncomfortable at the location. For a number of years, VAGMA held the show at the Greenbrier County Fairgrounds, in Lewisburg, West Virginia. A lovely and cool location in June in the woodsy greenery of the Shenandoah Mountains. Most recently, the show has been held at the Shenandoah Valley Fiber Festival in Berryville, VA during the last weekend of September. In 1995, VAGMA was incorporated and in 1997 the association earned its 501-C-(5) status. In 1997, the official VAGMA website came online. Currently the membership has grown to include over 15 states, from New Hampshire down to Florida and is now extending west to Ohio and Michigan. The popularity of the beautiful and useful Angora & Colored Angora goat continues to grow along with its representation of breeders.